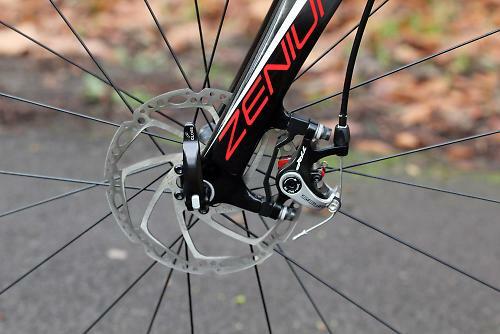 Disc brakes may not be allowed in the peloton just yet but that hasn't stopped Vitus adding them to their aluminium alloy Zenium race frame. The new TRP Spyre equipped Zenium VR Disc model has a responsive ride backed up with excellent braking performance and modulation making it ideal for those spirited club runs or fast commutes. If you've read some of our other reviews on aluminium alloy bikes you'll notice that the material has come a long way since the turn of the century and a lot of newer aluminium framesets don't have the overriding harshness of old. Well no one told the Zenium VR. The stiff ride is like a blast from the past as you feel every single road imperfection through the seat of your chamois as you hammer along. Hammering along is what'll you'll be doing too as the Zenium likes to be ridden hard; you get plenty back from it at speed and the feeling eggs you on a bit to keep pushing harder. That stiffness manifests as some great power transfer and while just shy of 9kg the VR responds well to acceleration and hard efforts from the rider. Out of the saddle or seated it'll shift when you ask it to and you can really bury yourself without the slightest hint of flex from the down tube, bottom bracket or chainstay areas. As far as the handling is concerned the Zenium is very easy to ride, engaging enough to get a bit of an adrenaline buzz from pushing it into a bend without being a handful at any point. The front end has a tapered steerer which keeps things tight and it tracks nicely through twisty descents unless things are really tight and steep then you notice a little bit of crispness in the steering. 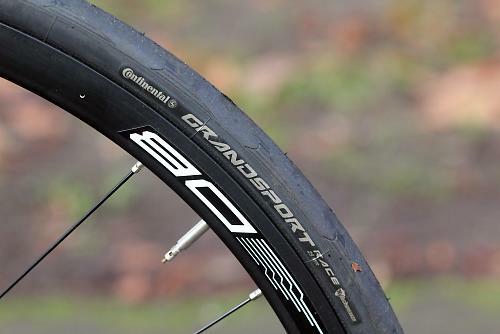 The Continental Sport tyres add plenty of grip though with their softish compound and 25mm width. Thanks to the compact 50/34 chainset and 11-28 11 speed cassette, riding in a hilly terrain doesn't become a chore. The stiffness of the frame comes through again and whether in or out of the saddle the Zenium VR responds well to the effort. The weight of the Fulcrum Racing Sport DB wheels becoming apparent at lower speeds is the only drawback. Looking at the geometry tables the Zenium VR Disc is pretty much the same as the standard rim braked version with just a 5mm increase in chainstay length and therefore wheelbase. This helps with chainline and heel clearance when moving to a 135mm hub spacing instead of the usual 130mm. Our 54cm has a top tube length of 545mm (effective as it slopes) with a head tube of 145mm giving a stack and reach of 549.3mm and 377mm respectively, certainly a nod to the performance end of the market. The frame uses heat treated 6061 aluminium alloy which is tidily welded and finished in a bold red paint job. The tube walls are triple butted removing a little bit of weight and bringing in a small amount off flex for comfort helped ever so slightly by the narrow seatstays. As I said above though don't be expecting an armchair ride. As far as quality goes it looks pretty impressive. This is a race frame though so you don't get any mudguard or rack eyelets and other than the caliper bosses there are attachments for water bottles and that's about it. The Zenium comes with 25mm tyres though 28mm should fit fine too. The fork is full UD carbon, yep that includes the tapered steerer which is impressive at this price point. A full Shimano 105 groupset is a nice touch and in black it looks great on the frame too. 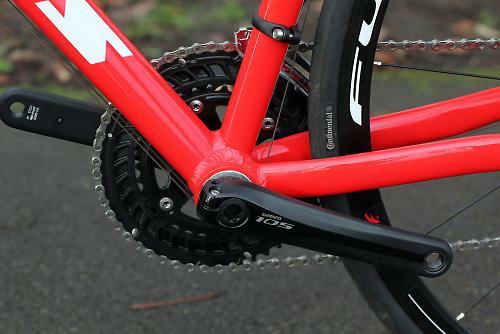 The compact chainset and wide ratio cassette gives you all the gears you should need and as we mentioned in our review, the shifting is spot on making it pretty much the best group on the market when you take value into account. 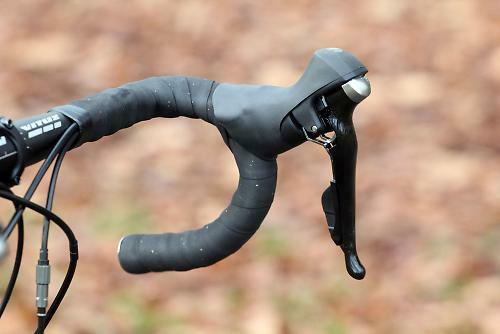 The shifters have changed shape in their 11 speed guise which gives a more comfortable platform to rest your hands plus they can be adjusted for reach by way of a bolt so no more faffing with shims and the like. The shifting speed and precision has been improved on the 5800 series over the old 10 speed 5700 version; every shift is crisp even under load, especially at the front mech. It stays that way too as it requires very little in the way of maintenance once set up. TRP provide the brakes with their cable operated Spyre model with a 160mm rotor up front and 140mm at the back. 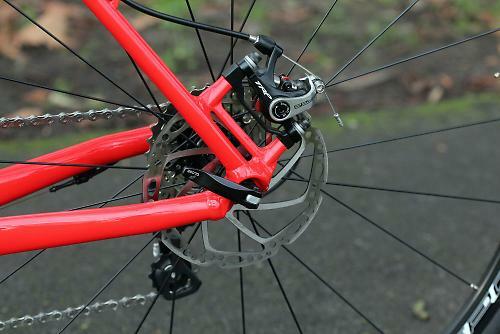 These are the best cable operated disc calipers I've used, offering 95% of the feel and modulation of hydraulic brakes. I find when I'm riding discs I tend to leave my already late braking even later simply because the power is there if I really need it. Heavy braking can lift the rear tyre and cause it to lock under weight transfer but no more than a powerful rim brake, the difference here though is that with the Spyres is that you can control this much, much more easily. 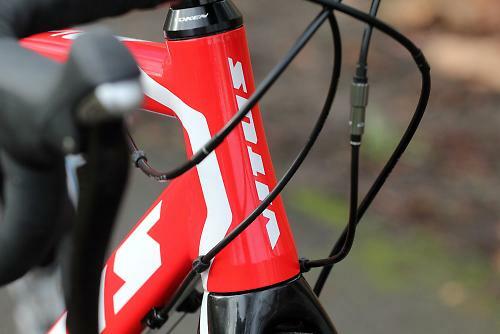 The real benefits come in the wet especially on a bike like the Vitus where you are likely to be carrying some speed. If something goes wrong you know you're going to be scrubbing off velocity straight away. The rotors are bolted on to Fulcrum's Racing Sport DB wheels. Considered entry level in their range they are still decent performers albeit weighty ones. Like all of Fulcrum's wheels they are bulletproof, with the seals keeping the wet and salty crap out of the bearings over the test period. The semi deep rim gives them a smart look and also makes for a stiff rim under effort. As far as acceleration goes you notice the weight from a standing start but once rolling they'll increase speed pretty quickly. All in all for a wheelset getting on for 2kg things are impressive though. The Continental tyres performed well too. I'm not usually a fan of Conti's wet weather performance especially on their cheaper tyres but these gripped pretty well on cold damp tarmac. They are hardwearing too with no visits from the puncture fairy in seven hundred miles of testing. Vitus branded parts make up the rest of the bike and their alloy stem, bar and seatpost combo offers very good value for money components. The bars have a shallow drop and are very comfortable in terms of the positions they offer. Like the frame, all three components are super stiff so if you're going long distance you might want to up your padding. 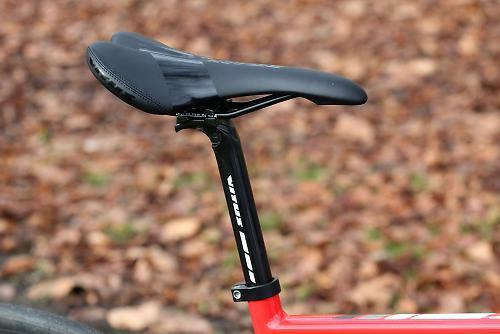 The Vitus saddle is nice; I found it instantly comfortable and wouldn't look to change it at all. I loved it, pure and simple. I liked the way the Zenium VR feels at speed with the stiffness magnifying the feeling of how fast you are actually travelling. In a group or riding through traffic the steering is controlled and easy to live with meaning you don't get any surprises. Hit the twisty lanes or descending and it excels here too unless you are really pushing it, I'll happily sacrifice a bit of crispness here though for the mild mannered handling you get elsewhere. I couldn't live with it as my only bike though. The stiffness of the frame, fork and components meant I was glad to climb off of it after three hours and I certainly wouldn't want to be doing a sportive distance on it. For £1049.99 I think the Zenium VR is very good value for money indeed. A triple butted 6061-T6 frameset, tapered full carbon fork mated with a near complete Shimano 105 groupset is as impressive on paper as it is to ride. If you're the type of rider that likes to ride at race speeds but doesn't actually want to race then the Vitus Zenium VR is definitely one for your shortlist. With more and more lightweight disc wheels coming onto the market the only upgrade it requires is an easy one to make it truly a performance machine for not much money. 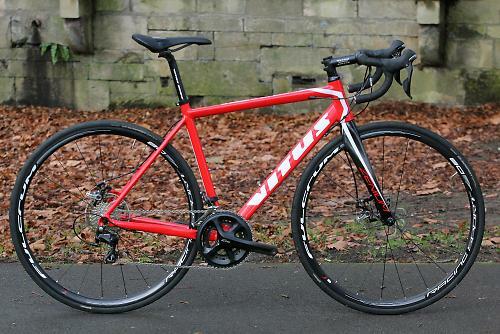 Vitus have added disc brakes to their alloy race bike the Zenium to create the VR Disc which "provides you with a lightweight performance bike that has added braking performance in all weathers." At 19lb it's exceptionally light but for the cost it's acceptable and it certainly has the peformance. It's tidy and well put together finished of with a decent paintjob. 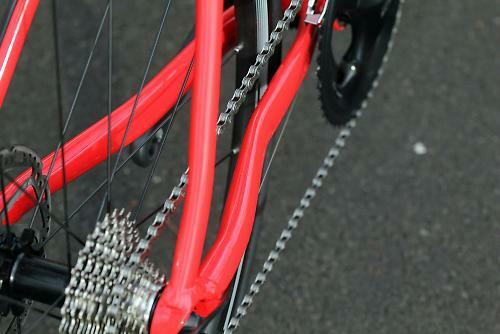 I'm not usually a fan of bright red but found the Vitus rather striking. 6061-T6 aluminium alloy for the frame and a full carbon fibre fork with tapered carbon steerer. Well balanced and fully in proportion for the style of bike. Details in the geometry charts above. 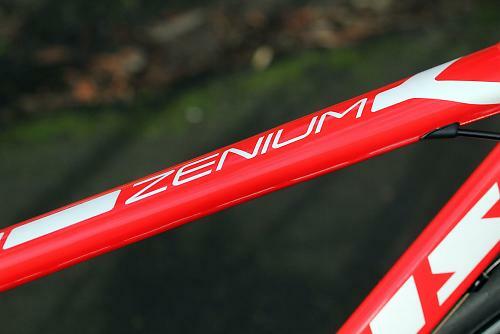 It depends on how harsh you like your ride, the Zenium VR is very stiff which can become jarring on longer rides. Stiffness is good, it'll certainly remain tight under load. Very well indeed, pretty instant. It's an easy bike to ride, not quite as direct as a full top level race bike but impressive in terms of its market. The alloy components add harshness to the already stiff frame. The 25mm tyres soak some of the bumps and there is room to go larger. The bars and stem are very tight for hard efforts. The heavy wheels hamper acceleration so a possible upgrade in the future would transform speed pick up. 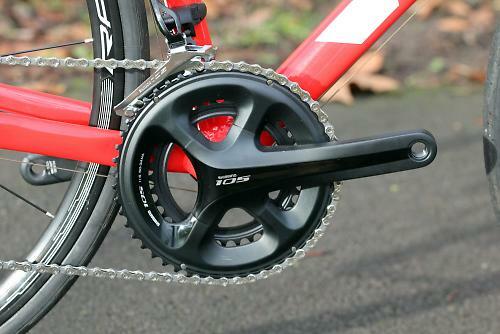 Shimano 105 11spd is brilliant and it's really good to see at this price. 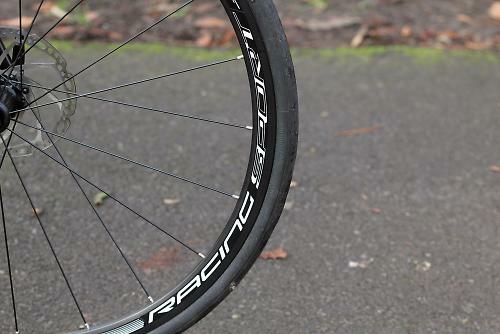 The Fulcrum wheels are entry level in terms of disc wheels but they perform very well indeed. They stood up to the wet, salt covered roads of the test period with no issues. The Continental tyres held up well in the same conditions. It's all good quality kit for the money and looks good too. The compact bars and adjustable gear shifters we'll be great for small hands. 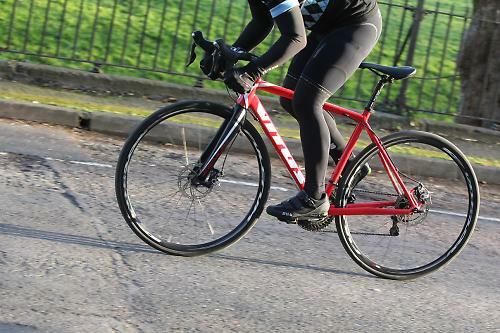 The Vitus Zenium is a very good bike when you look at the kit on offer for the price. It's a nice bike to ride and although it is very stiff and a touch harsh if you want something to get out for a quick blast on it's ideal.